On Tuesday, we talked about what is would be like to be a cyclops. Then we acted it out. I wish I had a photo or video to share the experience with you all, but I guess you’ll just have to use your imagination. My professor described the cyclops as a metaphor for the limited perspective we all suffer from at times. Do you know about the Monkey Business Illusion? If you stay focused on a task (ie: count how many times the players wearing white pass the ball) you’re likely to miss something else. The first time I watched this video, I had no idea the curtain color changed from red to yellow or that a person left the scene. This psychological test reminds me of high school. I would sit at the kitchen table, reading my history textbook, trying to solve math problems, or worse — writing an essay. My entire family could be walking around, talking, screaming, laughing, or whatever, and I would have no idea what was going on around me. One day, after failing to get my attention, my little brother LICKED my elbow … I didn’t even notice. That’s the day I realized my intense capacity to focus. Talking in class on Tuesday, however, I really started to understand just how much I miss when I’m this absorbed on the task in front of me. I miss the jokes, the sarcasm, the smells, the facial expressions and the little things that make a moment. I can’t multitask as much as I thought I could, and I don’t think I’m alone. According to the Harvard Business Review blog, multitasking does not exist, at least not in the way we think about it. Based on over a half-century of cognitive science and more recent studies on multitasking, we know that multitaskers do less and miss information. Long-term memory suffers and creativity — a skill associated with keeping in mind multiple, less common, associations — is reduced. So tonight, on my way to a meeting, I stopped rushing and looked outside. 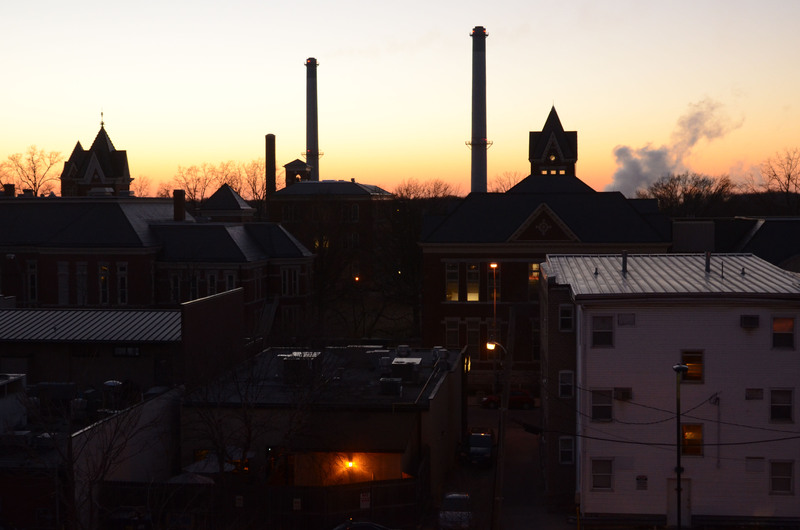 The view from Hitt St. garage really is lovely at sunset. #1 I think we should have a car-free Sunday. Americans should give up driving for one day a week to save gas, limit pollution and just take it slow. Even one day out of the year would make an impact! If this exists, I haven’t heard about it. #2 Cheese, sweet potato chips and white wine make a great after-dinner snack. I think you should enjoy the food you eat, especially after a long day. We push ourselves to be productive and stress out over mistakes, but at the end of the day we all deserve a little reward. We earned it. I think the suggestions about a car-less day and enjoying food and drink illustrate the endless possibilities of creativity–it doesn’t always have to be Big C creativity to be meritorious. The suggestions also reveal that sometimes it is a matter of forcing ourselves (or a nicer way to put it is training ourselves) to embrace a new way of doing and being…the creative way!